Sickle cell disease (SCD) is a blood disorder. 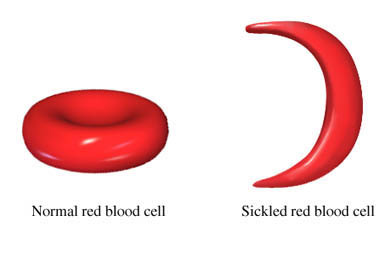 The shape of some red blood cells (RBCs) change to a sickle (crescent moon) shape. The sickle RBCs can block blood flow in blood vessels. This will slow or stop the flow of blood and oxygen to tissues and organs. The body will also destroy these RBCs because they are abnormal. This means you have fewer overall RBCs. Low levels of RBCs is a condition called anemia. This makes it harder for the body to get the oxygen it needs. A defect in the genes causes SDC. This gene causes a problem with a part of the RBC called hemoglobin. Parents pass the defect to their children. SCD will only develop if you get the defective gene from both of your parents. If you only get one defective gene, you will not have SCD. But, you can pass this gene on to your children. Sickle cell disease is most common in people who are Black or have with African ancestry. Other backgrounds with high risk include Hispanic, Asian Indian, Middle Eastern, and southern European. SCD may cause other serious problems such as a stroke , or painful erections lasting 4 hours or more. These problems need immediate care. Young children may be given penicillin daily. It can help to lower the risk of certain infections. It’s given until the age 5 years. Penicillin is also used for people who had their spleen removed. Hydroxyurea is a pill that can help lower the risk of or prevent health problems. It increases the production of healthy hemoglobin. Hydroxyurea lowers the chances of sickle cell crisis. It’s not right for everyone. It’s also unsafe for pregnant women. Blood transfusions raise the number of healthy RBCs. Transfusions treat anemia. They also help with liver problems or stroke. HSCT is currently the only cure. It's not right for everyone. A donor with matching blood proteins will be needed. This is most often found in a brother or sister. There are also a number of medical risks involved. For one, the immune system will need to be suppressed for the rest of your life. This can increase the risk for other illnesses. HSCT may be considered in children who have had severe complications. Regular medical care is important. Keep in touch with your healthcare team. Early care of health problems may keep them from getting worse. Daily folic acid supplements. It will help to build new RBCs. Drink plenty of water. Try to avoid dehydration which can trigger problems. Avoid places that are very hot or very cold. Avoid physical exhaustion and stress. There is no way to prevent sickle cell disease. If you plan on having a family, talk to your doctor about genetic testing if you're at high risk. If you're pregnant, a prenatal test called amniocentesis can detect SCD before birth. Sickle cell disease. Family Doctor—American Academy of Family Physicians website. Available at: https://familydoctor.org/condition/sickle-cell-disease. Updated September 8, 2017. Accessed July 18, 2018. Sickle cell disease. Kids Health—Nemours Foundation website. Available at: http://kidshealth.org/en/parents/sickle-cell-anemia.html. Updated May 2018. Accessed July 18, 2018. Sickle cell disease. National Heart, Lung, and Blood Institute website. Available at: https://www.nhlbi.nih.gov/health-topics/sickle-cell-disease. Accessed July 18, 2018. Sickle cell disease (SCD). Centers for Disease Control and Prevention website. Available at: https://www.cdc.gov/ncbddd/sicklecell/index.html. Updated June 18, 2018. Accessed July 18, 2018. Sickle cell disease in adults and adolescents. EBSCO DynaMed Plus website. Available at: http://www.dynamed.com/topics/dmp~AN~T902929/Sickle-cell-disease-in-adults-and-adolescents . Updated January 19, 2018. Accessed July 18, 2018. Sickle cell disease in infants and children. EBSCO DynaMed Plus website. Available at: http://www.dynamed.com/topics/dmp~AN~T902928/Sickle-cell-disease-in-infants-and-children . Updated May 7, 2018. Accessed July 18, 2018. 1/4/2011 DynaMed's Systematic Literature Surveillance http://www.dynamed.com/topics/dmp~AN~T902929/Sickle-cell-disease-in-adults-and-adolescents : Vichinsky EP, Neumayr LD, Gold JI, et al. Neuropsychological dysfunction and neuroimaging abnormalities in neurologically intact adults with sickle cell anemia. JAMA. 2010;303(18):1823-1831.